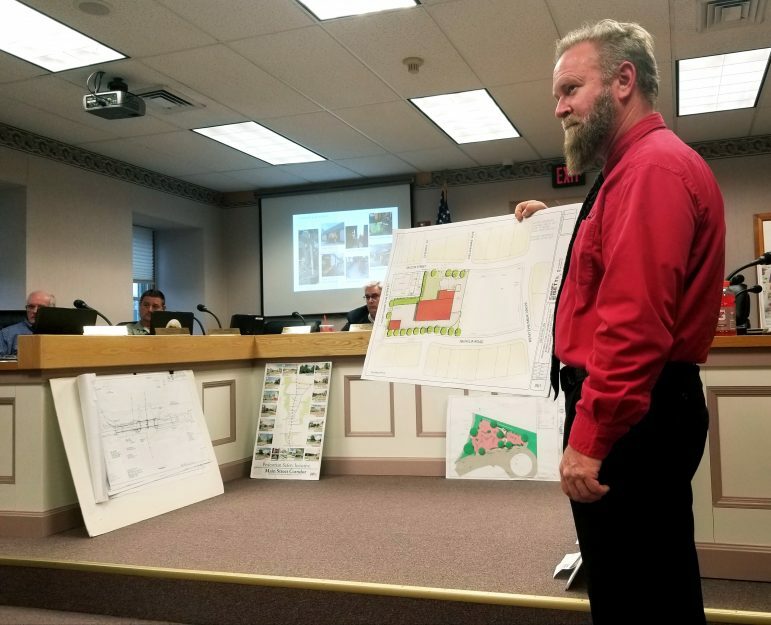 Hellertown borough engineer Bryan Smith of Barry Isett & Associates displays an above-view rendering of a proposed public works complex at a special council meeting April 8. 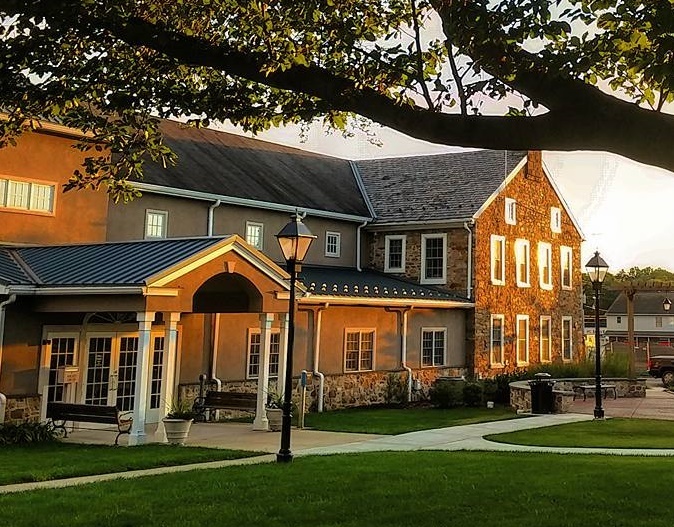 Correction: An earlier version of this story listed the incorrect date of the next Hellertown Borough Council meeting. 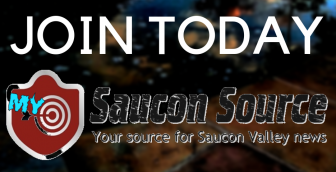 The correct date is Tuesday, April 16. The meeting will be held at 7 p.m. in Hellertown Borough Hall. 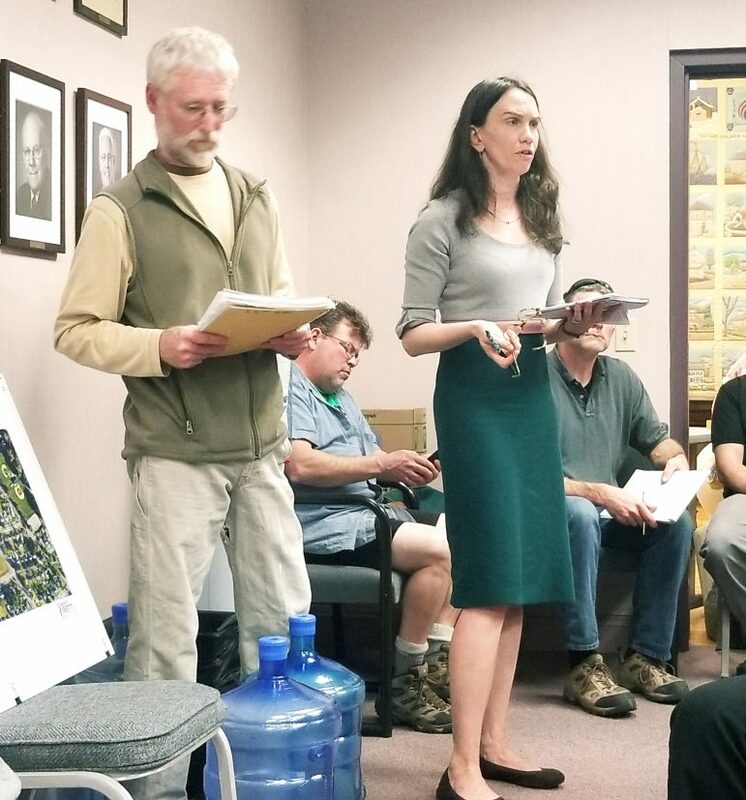 A proposed public works building that would be constructed on borough-owned property in a residential neighborhood was the subject of a special council meeting held Monday that was attended by several dozen residents. The meeting began with an overview of the proposal–first discussed last September–presented by borough engineer Bryan Smith of Barry Isett & Associates. The Reinhard School once stood on the now-vacant land between Magnolia Road, Northampton Street and E. Saucon Street; land that 20 years ago was sold to the borough for $1 by the Saucon Valley School District with the stipulation that it could only ever be redeveloped for municipal purposes. Smith noted that the new public works facility would have two access points: one off E. Saucon Street and the other from Northampton Street. An artist rendering of the proposed public works facility that would be built on land where the Reinhard school once stood. This view is looking west toward Northampton Street and the Saucon Valley Community Center (pictured in the distance). The E. Saucon Street drive would lead to a parking area and the main building’s office entrance. All of the public works vehicles would be stored inside the building, which is where servicing of the vehicles would also take place, Smith said. Around the new complex landscape improvements such as street trees and buffer plantings would help to obscure the buildings from view. An artist rendering of the proposed public works building depicts landscaping around it. Not all public works equipment and functions would be moved to the new location, if it is built, the meeting audience was told. For example, the salt and cinder piles currently maintained at the grist mill public works area would remain there. Rich Williams, a resident of the neighborhood where the new complex would be built, asked why that particular site was chosen over others. “The drawings are very pretty but it seems like you’ve already figured out this is where you’re going to put it,” he added. 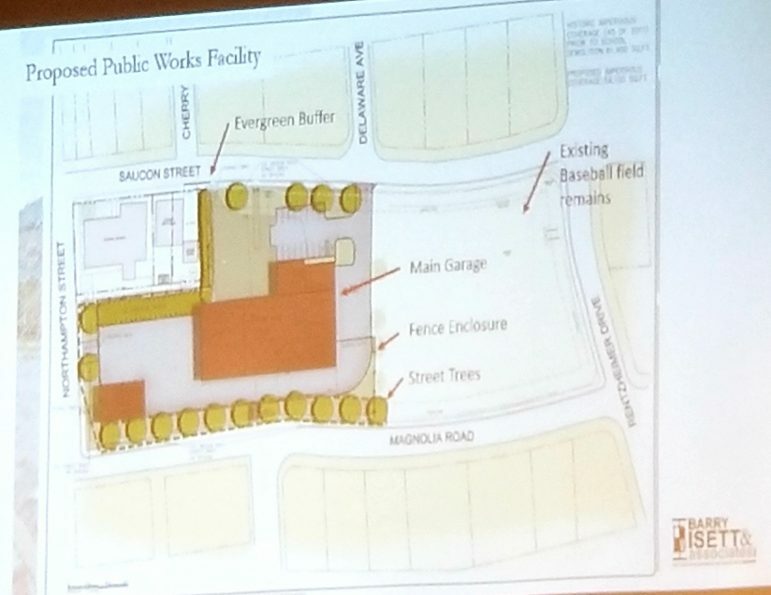 This diagram shows the possible layout of the proposed Hellertown Public Works facility. Council members said a final decision about building in that location has not been made, however the other areas that were examined as potential locations all have significant drawbacks, council president Tom Rieger said. 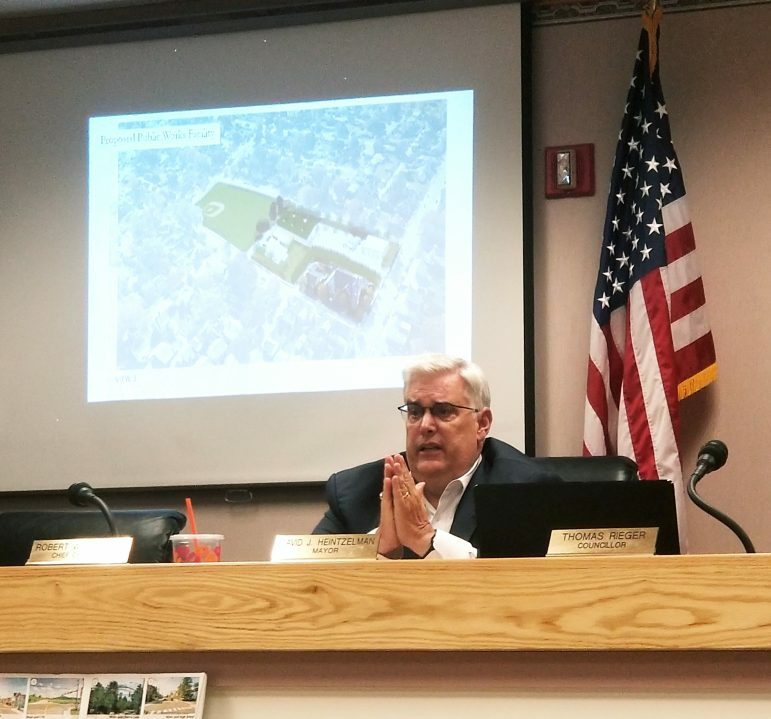 The borough looked at redeveloping the so-called “High Street field” at W. High and Whitaker streets, but in order to make that site work it would have to purchase two other parcels and pay for extensive storm water management improvements there, he said. The greater risk to using that site is that it was once used as the borough’s “dump,” which means the geology of it is somewhat in doubt. Rieger estimated that all-told, the use of that location–which also borders a residential neighborhood–would cost in the “multi-millions” of dollars. Along the Saucon Creek on Hellertown’s western fringe the borough owns a relatively vast amount of property that was once part of the Thomas Iron Works, and is colloquially known as the “Cinder Banks.” However that land, along with property to the south that is part of the Grist Mill recreation area, was acquired under the federal government’s Act 70 in the 1970s and cannot be redeveloped by law. Rieger said buying the so-called Kichline property between Main, Pine and Front streets would be cost prohibitive. “The problem of acquiring other property…is the cost of the acquisition itself,” he said. On top of an estimated cost of $500,000 to $1 million, by purchasing private property the borough would also be removing a taxable parcel from its tax rolls, and thus would lose all future tax revenue on it. 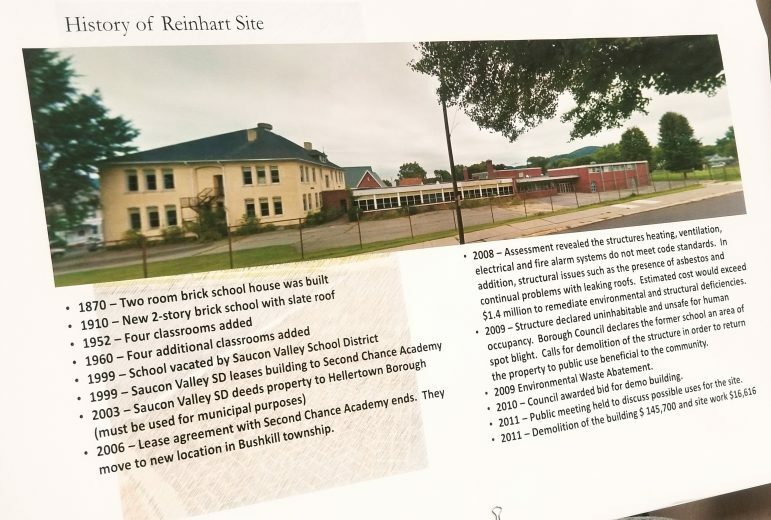 An infographic on a poster at the special council meeting included a timeline for the Reinhard School site. Another question that was addressed was: Why not expand the current public works building to meet the department’s needs? This question was addressed in several ways by borough officials. Known colloquially as the “horse stables,” Smith said that physically there just isn’t enough room within the borough hall complex to expand it. 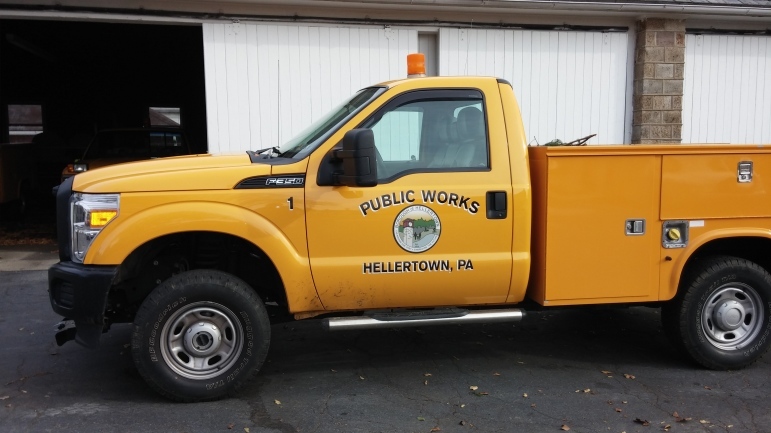 A Hellertown Public Works Department vehicle sits in front of the current public works building, which borough officials say is antiquated and unable to meet the department’s needs (FILE PHOTO). The building is antiquated, with dirt floors, and has been adapted over many years by public works staff to meet some of their needs. However, it is too small to allow for the inside servicing of vehicles, and an attached two-story building that was once home to the Hellertown Bottling Company is in poor condition and may ultimately need to be demolished, Rieger later said. The land behind the horse stable is part of an easement and unable to be developed because there are water and sewer lines in it, attendees were told. If the public works department is moved from its current location, the horse stables would be freed up for use by the Hellertown Police Department, which has a chronic space shortage. Most likely police department vehicles would be stored in the readapted stable building, which would then free up additional parking outside Borough Hall, where space is also at a premium, Rieger said. Hellertown Borough Hall houses the Hellertown Police Department as well as other offices (FILE PHOTO). Borough officials have previously said they feel some pressure to expand and modernize the police department headquarters, because they don’t meet 21st century policing needs and in some ways are non-compliant with today’s standard best policing practices. For example, the borough police department only has one small holding cell which dates from the 1940s, and it has no dedicated area for processing juvenile arrestees, Rieger said. 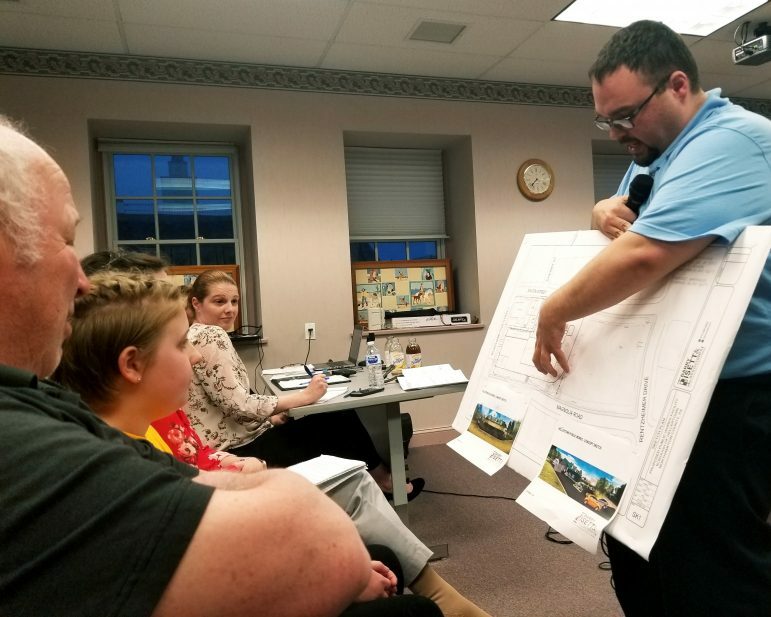 He said the entire transition to a 21st century Hellertown Police Department is a project that is likely “decades in the making,” and moving public works to another location would be a first step. Several residents said they believe the relocation of public works–which Rieger said was first discussed in the 1960s–is long overdue. “The longer you wait, the more money it’s going to cost you,” resident Larry Muldowney told council. Muldowney said he would prefer to see the borough increase taxes to pay for the building, rather than apply for grants that may or may not materialize. That idea did not appear to be popular with most of the other residents at the meeting. Hellertown borough has one of the highest municipal tax rates in the area. The idea also did not one appear to be one that council members were ready or willing to entertain. Their plan has been and remains to secure grant funding for the public works project, Rieger said, and the borough recently applied for two gaming grants that could have supplied funding. It was not awarded a Monroe County grant, but Rieger said the borough will reapply for it, which council recently voted to do. Project opponent and borough council candidate Bill Broun called the grant applications wasteful, in light of the fact that the borough could be seeking money for other projects that would benefit residents. “Projects that actually need to be done aren’t going to be done now, thanks to this council’s unwillingness to listen to its community,” Broun said in a prepared written statement. Broun also asserted that the vacant land is a park because it functions as such. “There are children on it constantly. They are on it year-round,” he said. The site of the former Reinhard School in Hellertown is currently a vacant lot at Northampton Street and Magnolia Road (FILE PHOTO from September 2018). Broun also took issue with comparing the elementary school building that previously occupied the site with the proposed structure. “The idea of a school being the same as a diesel truck garage is laughable,” he said. Annmarie Drury, who is married to Broun, said she fears the development of the site for public works will “degrade” the neighborhood her family loves. “If property values are degraded, this will be bad for all of Hellertown,” she said. Hellertown resident Annmarie Drury addresses council regarding concerns she said she has about how the proposed public works facility could degrade both property values and the quality of life in her neighborhood. Pictured at left is resident Terry Boos. Pictured seated, at center, is resident Rich Williams. 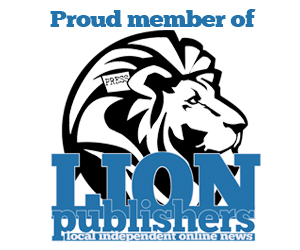 Both Broun–in his statement–and Drury while speaking questioned why borough officials are using the police department’s space shortage as an argument for moving public works, when at the end of last year the borough laid off a full-time police officer. Rieger responded by saying the police officer was laid off because the casino grant money that paid his salary was no longer available after the section of the state gaming law that allowed grant funding to be used for such a purpose was judged unconstitutional two years ago. Dave Schweisgut, a resident of E. Saucon Street, questioned the heavy use of the land as a play area asserted by Broun and Drury, who said she can see the children playing on it from her window. Schweisgut said that when Reinhard Elementary School was open, quiet wasn’t necessarily the order of the day, since there would be children “screaming” while outside playing. “This is actually a good thing compared to what it was before, and if you lived there before you would have that as a comparison,” said Schweisgut, who said he has lived in the neighborhood since 1991. Elaine Lipp, a resident of Ellen Street who said her husband is a former borough public works employee, also said she doesn’t believe noise will be the issue that some residents who are opposed to the project think it will be. She said the shop where the public works staff are now based is quiet most of the day, as the workers are out in the community performing tasks. “It’s not like they’re going to have a whole fleet of tractor-trailers,” she said. In fact, the majority of the vehicles that would be stored at the complex would be pickups, Rieger said. Their dumptrucks aren’t used daily, he added. These reassurances did not assuage Broun, who is part of a group of residents opposed to the building called Concerned Neighbors of Reinhard Field, which presented council with a petition in opposition to the project in February. At the time he said about 45 residents had signed it. An aerial view of the proposed public works project. 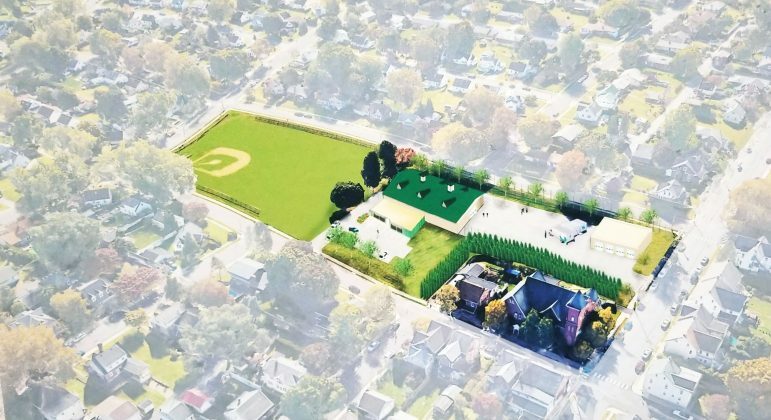 Northampton Street is in the foreground (lower right) of the rendering, with the ballfield and behind Rentzheimer Drive to the left. At the conclusion of Monday’s meeting, when borough officials asked for a show of hands straw poll regarding the proposal, about half a dozen hands went up in opposition to it. Approximately three times that many hands went up in support of it. Broun later called that straw poll a “spectacle,” and said some residents of his neighborhood who oppose the public works building proposal didn’t attend the meeting because they don’t trust the process at thist point, or because they had work commitments. “You don’t have community support,” he said. Rieger encouraged residents to bring their ideas regarding the project to him, via phone, email or even in person. Councilman Mike McKenna stressed to attendees that no final decision about the proposal has been made. Mayor David Heintzelman speaks at the special borough council meeting April 8. Heintzelman said he was happy to hear the feedback of residents, and in particular that of a girl who attends programming at the Saucon Valley Community Center. The girl who was accompanied by her mother said she was concernd about the possible loss of play space outside the center, which she said she uses. Heintzelman said that was something he hadn’t thought about, and Rieger said borough officials will talk to the community center about the proposal. Rieger also suggested the idea of hosting another public meeting about it, to continue the discussion and exchange of ideas, which he called a conversation. The next regular Hellertown Borough Council meeting will be held Tuesday, April 16 at 7 p.m. in Borough Hall, 685 Main St., Hellertown. Meetings are open to the public and are normally held the first and third Monday of each month at 7 p.m.
Hellertown Borough Council president Tom Rieger holds a diagram that shows the location of the Saucon Valley Community Center in relation to where the proposed public works complex would be built.